Is it just us or does it look like a face? In case you've forgotten, Google self-driving car currently has no physical controls beyond a start and stop button, but California's Department of Motor Vehicles isn't too hot on the idea. New rules, which will come into place next month, will prevent Google's autonomous vehicle from public road testing in the US State unless it adds manual controls. And according to The Wall Street Journal, Google will oblige by building in a steering wheel and pedal system for its test vehicles, allowing it to stay on course for its rollout. As for Britain, the UK Department of Transport told TechRadar that a regulatory review is currently underway, as changes to the highway code are being considered - but a similar rule could apply. "We'd anticipate that early cars would have to have a driver in the seat ready to take over [with manual controls]," said a spokesperson, but "nothing has been decided yet". 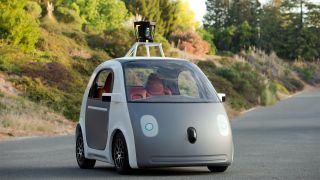 Google is building around one hundred autonomous cars to start testing next month. It won't be long until they make their way here - the UK government has outlined plans to start testing vehicles on public roads from January 2015. Google's self-driving cars will be limited to speed of 25mph, but will be allowed to exceed that limit when it believes doing so will improve road safety.